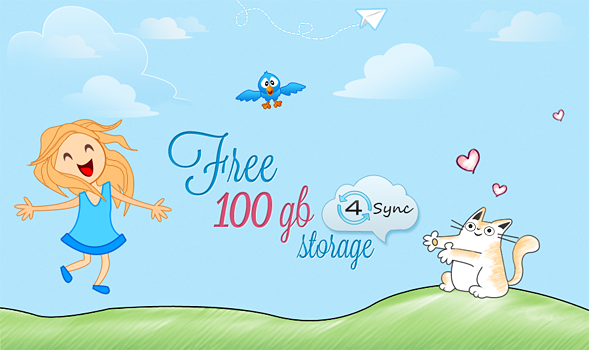 Get 100GB at 4Sync for free! Super generous offer to 4Sync fans! We’ll gladly give you FREE 100GB of storage space for 3 month, and THE ONLY thing you have to do is to SHARE this post on any of your social pages: Facebook, Google+, Twitter or Digg. Unbelievable, huh? Just push one of the social buttons above this post. The amount of free 100 GB Premiums is limited, so hurry up! Note: Log in using e-mail, on which you would like to get Premium. Give it a try and you won’t regret! get yourself 100 GB, its great and worth it. I love this service been using it for a while now . Woooowwwww this is fantastic,I love this,I’am 4sync fan,I use this in free version because my financial conditions do not allow me to pass on Premium :(,I hope to get a premium account,because it gives me a lot help for my work,This is a fantastic and unique offer. Thank You Very Mach 4sync.com! Twitter 2 My second account at work ! My Account Name In 4sync! Is this really true?? I can hardly believe it!! just what I wanted and needed!! What a wonderful service!! This is a really unbelievable offer. We are happy to get this offer. I hope it will be Good offer for every one. but I don´t receive de 100GB, could you explain me what can I do? I just post it and don’t get anything! Should be good to me! Just when it couldn’e get any better !! Hi, I have done instructions. May I know when I will receive the coupon for the 100G free? First of all Thanks for offering!!! Fantastic service with amazing free storage. Thanks very much and season’s greetings to all at 4Share. Now I have a bigger space for my family and friends. Free 100GB! You’ve got to be kidding…Im dumping this Dropbox crap ASAP! Can’t seem to get this right, how do I register? 100 gb is how long is it for? How long after going away? when it ceases to 100 GB of storage? So is valid? Why would I refer anyone or endorse you?? Today, I purchased 100GB premium upgrade with PayPal. My account still says I only have a free 15GB account. I have sent an e-mail to sales and tech support and have had no response. I called your toll free 877 number and the message states that the number is not currently in service. Are you guys still in business?? This is great. Every1 needs this. Awesome! Alucinante, nada menos que 100gbs. I posted 2 times already,my girlfriend too. never show the 100gb,I believe it’s just fraud. Is there anyone out there actually got it? Dear Nikos! The offer was valid only for a week (12.11.12 – 20.11.12). We wrote about it on our Facebook page. Now the action is over. Love this idea guys, keep up the good work! What a wonderful gift it is!